A few months back, we wrote of the conflicts surrounding the proposed tourist mega-development near Cabo Pulmo. 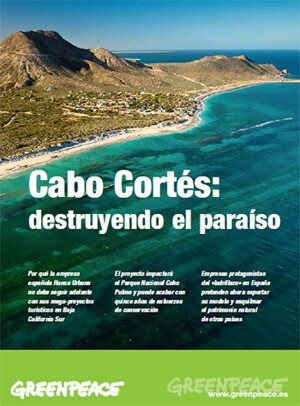 The controversial plans for Cabo Cortés involve building on the virgin sand dunes, and will undoubtedly have adverse impacts on the small village of Cabo Pulmo and the ecologically-sensitive Cabo Pulmo National Marine Park and its coral reef. This story, which essentially pits mass tourism against ecotourism, continues to attract lots of media attention. The latest major article is Plans for resort in Mexico ignite concern about reef, published in The Washington Post. The article looks at the Spanish companies involved in the ownership and construction of the proposed resort and quotes the opinion of local people who hope that the economic crisis in Europe will put an end to their grandiose plans. The Spanish firms involved are “ailing Spanish development conglomerate” Hansa Urbana, which bought the meg-development site in 2007, and a savings bank called CAM (Caja de Ahorros del Mediterraneo), which lent Hansa millions of dollars. Later, Hansa gave CAM the property in exchange for having its debt wiped clean. CAM has since been bailed out to the tune of $3.8 billion by the Bank of Spain, in which the Spanish government has a controlling interest. The Bank of Spain plans to auction CAM, but only after the upcoming Spanish elections. Mexico’s federal Environment and Natural Resources Secretariat (Semarnat) originally gave Spanish firm Hansa Urbana the green light to begin construction, but now say that construction can only begin if the developers can prove that the reef will remain unharmed. The government has set a deadline of January 2013 for the submission of a detailed report showing that construction will not cause any environmental damage to the Marine Park. The deadline comes only a month after President Calderon leaves office, which, as many locals realize, could be very unfortunate for the future welfare of the reef and local ecotourism activities. The diffusion of violence in Mexico since the early 1980s Why does Mexico, an oil producer, need to import refined petroleum products?